It's time for a new challenge over at House-Mouse & Friends MC. Our mega talented and super sweet DT Member Lols has provided us with yummy Cupcake Photo to use as our Inspiration. Yummmmmy!.... aren't these cupcakes gorgeous? Check out all the House-Mouse Challenge details at the HM&F MC Blog found HERE. Paper: SU Blue CS, WHITE CS, Cupcake BG Paper is corrugated and was cut off a mini goodie bag set (from Target $1 Section). BE SURE TO PLAY ALONG at HMFMC BECAUSE WE HAVE NEW GUEST DESIGNERS and SOME FABULOUS PRIZES UP FOR GRABS FROM THESE GENEROUS SPONSORS. 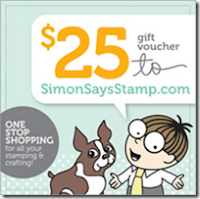 PRIZE: A $25 Gift Card to the Simon Says Stamp Shop! Hope you will join us!!! For more House-Mouse & Friends inspiration, be sure to check out the rest of the fabulous DESIGN TEAM's AMAZING PHOTO-Inspired creations HERE! p.s. Stay tuned for a HUGE BLOG-CANDY announcement that you wont want to miss!!! 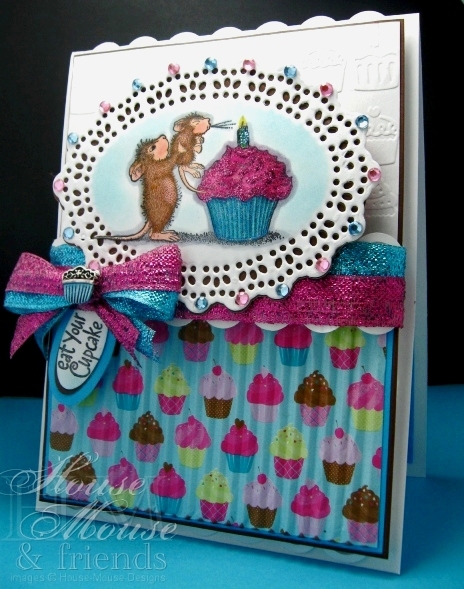 Gorgeous card America, love the fun cupcake papers and the gems on the points of the mat. Great ribbon and charm. So fun and cute. Awesome celebration card. What a fabulously fun card America. Super cute image you have used for your card. Stunning colouring and fab dp. Oh this is adorable! Absolutely love the colours as well!! Saw this on MIM! Wowow!!! your colours and papers are stunning!!! Your image is adorable and I love your design oval is wonderful. great and fabulous card america. As always, America, you've knocked my socks off with your beautiful card. The papers and embellishments are perfect with this beautifully colored image. Love it! 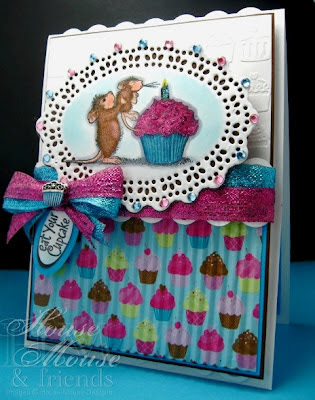 Wowzer cute creation loving the ribbled effect on your DP & I can just see the cupcake embossing on the white card..beautiful colour combo & the charm is brill stunning craetion..
What an adorable card you worked! I love it! Thanks for joining us at Kartenallerlei! There are so many gorgeous elements on your card, I hardly know where to begin! I LOVE that Maryanne oval die - wow!! Love the crimped panel and double bow too! Fabulous card!!! Thanks for sharing with us at Kartenallerlei! Your card is just perfect! I love the layout, the colors, the coloring. Just great! Saw you at MIM! America, This card is just delightful. I love everything about it. Total Winner in my book. Love your card. Tha image with DP is just perfect together. Thank you for sharing on MIM. Hi America, This is a stunning card, I love the vibrant colours you've chosen and those sparkly ribbons. I'm delighted to be a Guest with you all this month. Oh I LOVE your card!! Great make from the inspiration photo. Beautiful image and color combo. Yummy! I do not know how you pull off these amazing cards time after time...I never see a clunker girl LOL! Awesome card! This card is so beautifully done. Who wouldn't want to receive this for a birthday card...It's one that would always be treasured. So Lovely, cheerful, and elegant all at the same time.